At 33 yrs old I started having hand tremors than one day in front of my husband I had a serious seizure. In the ER a doctor realized it was my thyroid. I was diagnosed with hyperparathyiodism. A ultrasound showed tumors on my parathyroids. The doctor had to do a parathyriodectomy, removing all four of my parathyriods. Now my thyroid didn’t have those helpers anymore to function properly! 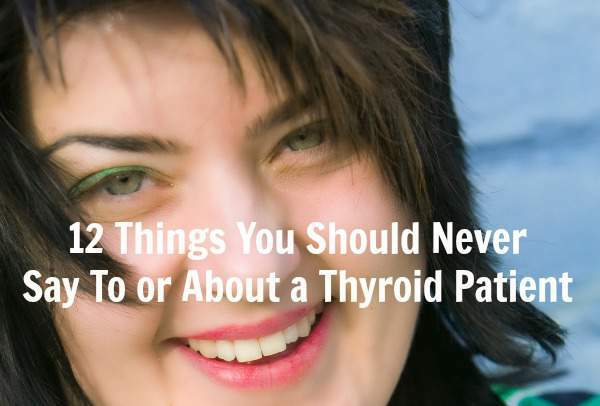 But no doctor told me at that time I would need medication for my thyroid. I suffered years of depression, feeling like I was in hole I couldn’t get out of and cried in the shower bc I hide my feelings from my sons 18,16 & 13 and husband. It wasn’t there fault I thought I was losing my mind. It was over twenty one yrs later at 54 yrs old that finally a doctor listen to my symptoms, she took a blood test and was horrified when she saw my thyroid levels. She told me she didn’t know why I haven’t killed myself. I told her I didn’t have the strength to do that! That’s when I enter the world of Synthroid medication and starting feeling like my old lively self, laughing again and watching my sons get married and now 3 wonderful grandchildren, one on the way! One thing I did learn from this experience is don’t aloud other peoples comments like the ones in this article deter you from being proactive about your health! I did and it took me too long to get my help for my now hypothyroidism. I’m 63 now and the last ten years have been good. Thank you all for showing me I am not alone, my doctor says I am all fixed,will not send me back to the hospital and that I am imagining it,I am crying now and don’t no how I can go on. But I will try,thanks again. Don’t forget about checking for Reverse T3! If you are under stress (lol, who isn’t?) then your T4 may be converting into reverse T3 instead of T3. It’s your body’s faulty idea of how to de-stress you by making you tired so you rest instead of do too many things! Kind of like when you didn’t have enough thyroid hormone your body made you hungry so you’d eat and then “you could have energy.” I remember having a perfectly good lunch and then feeling like I could eat it all over again. And I could eat a dozen doughnut for breakfast if I let myself. It was amazing when I got thyroid treatment that I could feel full after a normal meal! I was diagnosed with hypothyroidism about 3 years ago and put on thyroid medication 1.25mg. My TSH levels have returned to normal with the medication, but the symptoms continue. I have never felt my condition was controlled even though the blood work indicates normal as all the symptoms remain and even worsened. My doctor says my fatigue, brain fog, hair loss, brittle nails, skin conditions, facial hair, intestinal problems, weight gain are the results of other reasons; namely, lack of exercise, depression, diet, or my imagination. My medication has never been changed since it was prescribed 3 years ago, My doctor tells me my thyroid is fine and largely ignores my symptoms. Except for controlled hypertension and osteoarthritis, I am otherwise in good health. I am 76 years ol and barely existing, I have no energy to do anything even if I was motivated to participate in life. Just trying to cope with all the body changes and the inability to think properly is all I can manage right now. What should I do? I feel helpless and lost in this fog with no help or hope from my doctor. I had part of my thyroid removed in 1979 and have almost all of the above things said to me by well meaning friends and doctors. I have my T3,4 and 7 checked annually and there are times when my dosage has to be adjusted because the numbers are off. You do get accustomed to the problem and I still get questions about the scar on my neck. Thank you for the article. Entered my 20s … Was going ballistic. Still no diagnose. My 30s were about: loss of right eyebrow, bulging eyes, gastrointestinal issues, fatigue beyond me, swelling, hot , cold, hair didn’t care , southern region didn’t want any participation with the rest of the body. Was diagnosed Hypo- Hashimotos. Felt like I had something in my throat and it hurt to swallow. Went over to the Endo, ultrasound and needle biopsy. Results: cancer. Action taken: thyroidectomy. No idea on how my body will react on the next day! I’m in the fitness field and it’s hell to keep up with the fatigue, the cramping, the heart, the brain fog and especially how my muscles respond… Which sometimes it’s: STAY IN BED BECAUSE WE AINT MOVING! Now… I depend on a small blue pill to keep me ‘normal’ because my ‘ butterfly ‘… Has gone to far away gardens! What did you mean “ you were nuked at 13”? I have lost count of the number of times people have said (and yes sadly most of the time people close to me) ‘if you just went and did something physical you would feel better’. ‘Stop eating so much crap and you might lose some weight’. Now I just don’t bother telling anyone and just smile and nod when they start doling out life advice. TSH IS FINE = So no reason for the weight gain. Need to exercise more. NO SORRY it was Thyroid Cancer. There is one that I hate more than anything and have heard several times. “Oh don’t worry you got the GOOD cancer” erghhhhhh…. No cancer is every good and would swap places with them to live one day without a thyroid and then try saying that to me again. Totally agree. Same thing happened to me. Very frustrating. I had to research everything myself, and finally found a FNP that diagnosed me. Good luck, and take care. I got the same thing said to me. Talk about insulting. I’m sorry but just knowing it is in your body is horrible enough. I had the same reaction when I had Cervical cancer and especially when I had Malignant skin cancer. Yes, that was a great cancer, especially with the 7 inch long and inch wide scar going down my back and a scar by my armpit because there was 6 nodules in my armpit they had to get out that were cancerous connected. Now I am permanently numb from shoulder to elbow. People are ignorant and if they don’t have it then it just doesn’t exist. People throw around words like Bi-polar making fun of people if they get in a bad mood all of the sudden. I don’t have it but would never be so sensitive to say anything like that. It’s so awful-!!! Sorry, I went off a little bit I’ve been told things before, even by my husband and it hurts to the core. I’m very passionate about this. Good health to all and huge hugs!!! I have been on thyroid medicine since 1972 (when I was 24) and suspect I had it long before that. I have always been a lot more tired than my sister’s, have had a terrible weight problem (all these years yo yo dieting), and not being able to keep a stable weight. My mama always told me i was lazy. I recently had a thyroid test and my tsh was .569 which in on the very low end of normal. Would it not occur to my doctor that with my symptoms that maybe I need for my tsh to be more toward the high end of normal just to try to help me feel better. I don’t eat pasta, bread, rice, potatoes and go to exercise classes 10 hours a week. Some of the classes are really strenuous. I’m absolutely exhausted after these classes. I will be 70 in March and would really like to have a normal life.